I was planning on writing today about recognizing your achievements when your each a goal (especially for those who are competitive and highly driven), but it’s been a bad day. I woke up to a super triggery comment, read a few articles I should have avoided, and my mood plummeted from there. Add in a lack of sleep, and the soreness from working out for the first time in nearly a year, and you’ve got a recipe for a bad day. So instead of talking about what I was going to talk about, I’d like to talk about chain analyses and applying skills to stop a bad day before it happens. Sometimes it can be hard to notice when you’re on the path to a meltdown. You might know that you’re having a bad day, but you don’t quite know why or you don’t know what you can change. I’m going to try to go through a chain analysis of my own day to give you all a conception of what it might be like to think about what’s making you anxious, unhappy, depressed, or stressed out, and then go through the steps that I could have taken (and may still take) at different points during the day so I don’t engage in any target behaviors (this is DBT speak for doing Bad Things like restricting, purging, drinking, self-harm, suicidal ideation etc.). I’m going to start by talking about emotional vulnerability. I’m surprised this isn’t something that we talk about more often because it’s intensely important when you’re having a bad day or are on the verge of letting your mental illness take over. Emotional vulnerabilities are those factors that make you more prone to feeling extreme emotions. The most basic forms of emotional vulnerability are things like lack of sleep, lack of food, lack of exercise, use of drugs or alcohol, etc. These things make us sensitive and keep us from regulating our emotions well. Right now, I haven’t eaten since last night, I didn’t get enough sleep last night, and I have been working out more than I’m used to, leaving my body tired and sore. I’ve also been dealing with some headaches and bad tension through my shoulders and neck that are really fairly painful. These things are making me far more emotionally vulnerable. However in addition to these very obvious forms of emotional vulnerability there are other things: are you stressed out and busy? What’s going on in the back of your head that’s stressing you out? Are you having relationship troubles? Are you unemployed? What other things are hanging over you that surround the events of the individual day or event that you’re trying to understand? For me, this includes a number of things. I recently changed jobs and I’m not good with transitions. I had some new information about my family that was Big and Important and Scary dropped on me this weekend. A number of my friends have been having relationship troubles recently and I’ve been worried and anxious for them. I also haven’t been keeping up on my blogging so I’ve been feeling overwhelmed and busy. Each of these things adds to that cloud of vulnerability that’s surrounding me today. These are helpful concepts because if you start to notice vulnerabilities you can try to head them off. I’m going to go get something tasty and filling very soon, not let myself work out today, and try to get to bed early. Sometimes you can’t fix the vulnerabilities, or you get triggered or upset before you notice them. When you’re doing a chain analysis, the next step is to figure out what some of the precipitating events were. These can help you notice or avoid these kinds of events in the future, or if you’re in the moment, figure out why they bothered you and how to process/deal with the emotions you’re having right now. So today the precipitating events were a few things. The most noticeable of them was getting a comment on a blog post about veganism that said “having an eating disorder is no justification for forcibly impregnating cows and keeping pigs locked up in tiny pens etc. etc.” The topic of veganism is an intense trigger for me. I was writing about this in the post, and this person chose to ignore that and tell me that I was wrong and bad for trying to take care of my own health needs. I felt disrespected, and I felt as if another person was confirming to me that I am not worth the food that I put in my mouth. In addition to this, I saw another blog post defending “Blurred Lines” that made me throw up a little bit in my mouth. So I could see that the precipitating events to having my mood spiral out of control were that I felt people were challenging my values and my self-worth. So now I have a good understanding of what the problem is. I’ve had this difficulty a number of times before and so I’ve learned some techniques to help with it. One of them is that I try not to click on links that I know will upset me, and so usually I can head it off at the pass, but sometimes one gets by me or my morbid curiosity gets the better of me, and I can’t exactly not get the comments that are emailed directly to my inbox. Whatever your precipitating event is, it’s good to understand what it did to you and why so you can either avoid it in the future or figure out how to best tailor your response. So my response was to reevaluate my values. Check the facts. Remind myself why I do the things that I do. Remind myself why I felt that Blurred Lines was offensive. And then I tried to radically accept that some people have different values from mine. I did some self-soothing, because I felt attacked and raw and afraid (especially when someone said the line in “Blurred Lines” that goes “you know you want it” is not rapey, cause damn is that triggering and not ok at all). This consisted of seeing my boyfriend for lunch and drinking a chocolate shake. I tried some distraction by playing Lumosity and by focusing on work. But I also did some self-care by allowing myself to tackle the simplest tasks at work first so that I wouldn’t get overwhelmed. Because I had figured out all of the ways I was riled up, I could address each of them. Now that I’ve calmed down some I’m willing to look again at these emotions, understand what provoked them, and understand how my use of skills actually worked quite well. If you do engage in a target behavior, your chain analysis might include ideas of what you could have done differently. That’s why I find them incredibly helpful. 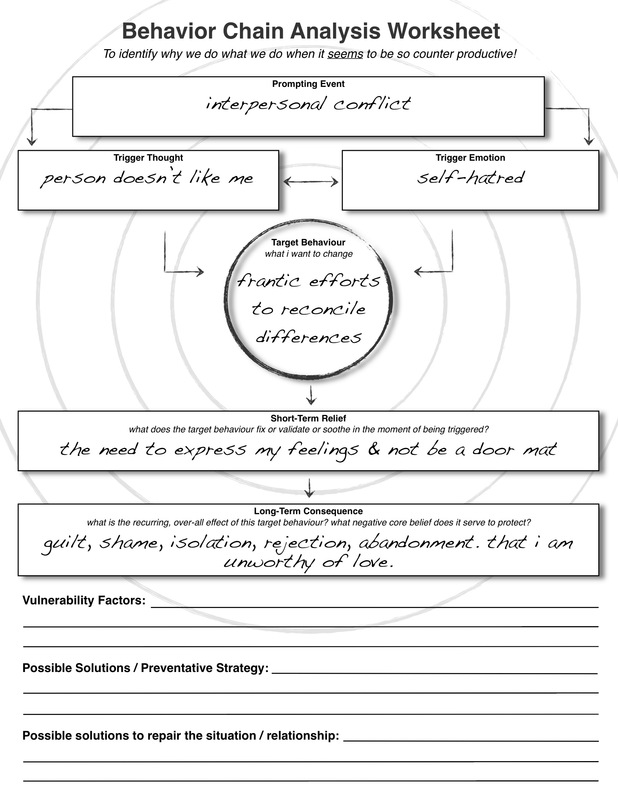 They give me a framework with which to reflect on my experience without ruminating and becoming overwhelmed. You can even draw it out all nice and pretty like with bubbles and arrows and things. If you want to really break it down you can delineate your reaction into thoughts, emotions, actions, and bodily reactions (so did you clench your hands etc.). This chain analysis method helped me head off the nasties before they got too nasty, but I’d love to hear other suggestions in comments. Tea, hot bath, nap, delicious food, mindfulness, self-soothing…whatever helps you!